Below you fill find all funeral homes and cemeteries in or near Clarion. 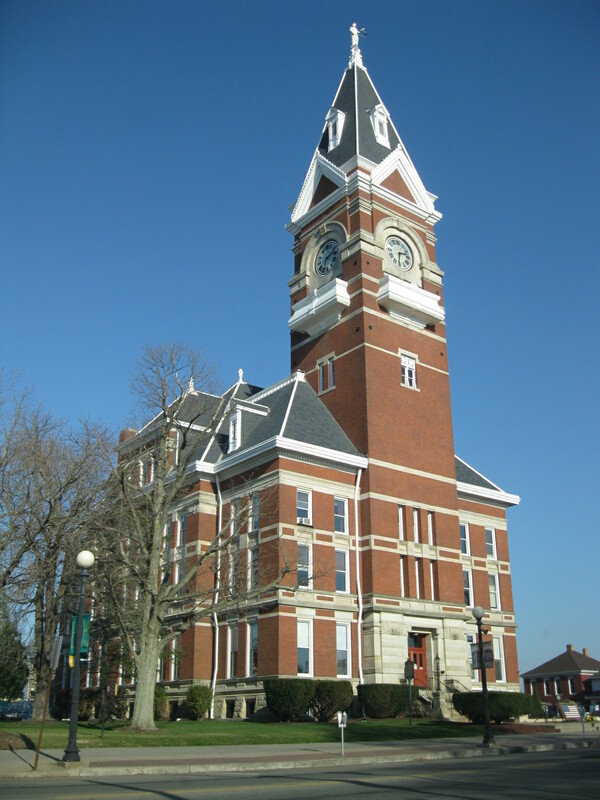 Clarion is also known as: Clarion County / Clarion borough. Their current mayor is Mayor J. David Walters. Zip codes in the city: 16214. Some of the notable people born here have been: Dolly Neely (shepherd), and Chris Kirkpatrick (singer and voice actor). Clarion is a borough in and the county seat of Clarion County, Pennsylvania, United States. It is located 77 miles (124 km) north-northeast of Pittsburgh and is part of the Pittsburgh DMA. Clarion was settled in 1839 and incorporated in 1841. In the past, the surrounding area produced natural gas, oil, lumber and coal. The population was 2,004 in 1900, 2,864 in 1910, and 5,276 at the 2010 census. It is home to the annual Autumn Leaf Festival and Clarion University of Pennsylvania. The county courthouse was added to the National Register of Historic Places in 1979. It was reported by Orange County Register on March 18th, 2018 that John W Jr Doverspike perished in Fullerton, California. Doverspike was 80 years old and was born in Clarion, PA. Send flowers to express your sympathy and honor John W Jr's life. It was reported by The Mail Tribune on December 31st, 2017 that C William "Bill" Saar died in Ashland, Oregon. Saar was 92 years old and was born in Clarion, PA. Send flowers to express your sorrow and honor C William "Bill"'s life. It was reported by San Diego Union-Tribune on December 24th, 2017 that Barbara A Hoyer (Mortland) passed away in Oceanside, California. Ms. Hoyer was 85 years old and was born in Clarion, PA. Send flowers to express your sympathy and honor Barbara A's life. It was reported on November 22nd, 2017 that Betty J "Betsy" Manchester passed away in Ransomville, New York. Manchester was 75 years old and was born in Clarion, PA. Send flowers to express your sympathy and honor Betty J "Betsy"'s life. It was disclosed by Daily Press on April 15th, 2017 that Charles Edward "Chuck" Hubauer perished in California. Hubauer was 85 years old and was born in Clarion, PA. Send flowers to share your condolences and honor Charles Edward "Chuck"'s life. It was noted by San Mateo County Times on June 10th, 2015 that James Ingram Mix passed on in Santa Clara, California. Mix was 58 years old and was born in Clarion, PA. Send flowers to express your sorrow and honor James Ingram's life. It was written on May 29th, 2014 that June L Bish (Neill) died in Clarion, Pennsylvania. Ms. Bish was 84 years old. Send flowers to express your sympathy and honor June L's life. It was disclosed on May 27th, 2014 that Peggy Ann Perry (Hannold) died in Clarion, Pennsylvania. Ms. Perry was 73 years old. Send flowers to share your condolences and honor Peggy Ann's life. It was noted on May 27th, 2014 that Selby Kline Proud perished in Clarion, Pennsylvania. Proud was 89 years old and was born in Streator, IL. Send flowers to express your sorrow and honor Selby Kline's life. It was disclosed on May 26th, 2014 that Darwin J Seigworth perished in Clarion, Pennsylvania. Seigworth was 76 years old. Send flowers to express your sympathy and honor Darwin J's life. It is the county seat of Clarion County, Pennsylvania County , Home to the annual Autumn Leaf Festival and Clarion University of Pennsylvania. Clarion was settled in 1839 and incorporated in 1841. Clarion is a borough in Clarion County, Pennsylvania County, Pennsylvania, about 100 miles (161 km) north-northeast of Pittsburgh and part of the Pittsburgh DMA. Merely 2,004 people lived there in 1900, and only 2,864 lived there in 1910. The population was 6,185 at the 2000 census. The official website for the city of Clarion is http://clarionboro.org/. Thank you for visiting our website. The Goble Funeral Home and Crematory has been a place of caring and compassionate service since 1952. Listing all funeral homes in Clarion, Pennsylvania so you can easily send flowers to any location (same day delivery) or find any funeral service. Clarion PA Area Health, Medical, Fitness, Optical & Dental Business Directory for health care and fitness businesses and services. We work with local florists and flower shops to offer same day delivery. You will find budget sympathy flowers in Clarion here. Our funeral flowers are cheap in price but not in value.